Israel’s massive 23-day Operation Cast Lead offensive on Gaza, which began on 27 December 2008, caused massive destruction and killed more than 1,400 people. Another 5,000 were injured. Just World Books of Charlottesville, Virginia, has now published a ground-breaking collection of short stories exploring the lives of Gazans during and since Operation Cast Lead. 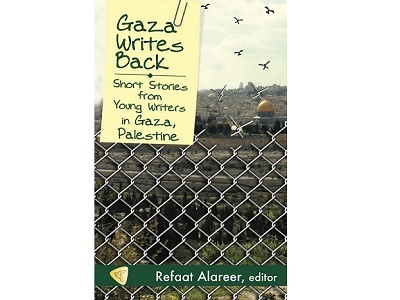 Gaza Writes Back: Short Stories from Young Writers in Gaza, Palestine, edited by Refaat Areer, contains 23 stories by 15 writers – all but three of them women. The number of stories equals the number of days Cast Lead lasted. “These stories take us into the homes and hearts of moms, dads, students, children, and elders striving to live lives of dignity in one of the world’s most embattled communities,” says the book’s cover. The book carries acclaim from prominent Palestinian and other activists and writers including Dr Ghada Karmi, Victoria Brittain, Ramzy Baroud, Jean Said Makdisi, Susan Abulhawa and Samah Sabawi. The book’s international launch took place in a packed-out event at the P21 Gallery in London on 16 January, and marked the fifth anniversary of the ending of Operation Cast Lead. It was chaired by author and former associate foreign editor of the Guardian newspaper Victoria Brittain. The London launch was followed on 18 January by a launch in the Malaysian capital Kuala Lumpur. Refaat has an MA in Comparative Literature from University College, London University, and teaches at the Islamic University of Gaza. He is currently doing a PhD in Malaysia. As a teacher of literature and creative writing he is a mentor to young Gazan writers, and was the prime mover in getting the book off the ground. Gazans have constantly sought ways of overcoming the blockade of Gaza and numerous other difficulties, and writing in many forms plays a vital role in this. They are adept and prolific users of social media, including blogs, Facebook and Twitter, and frequently contribute to online and other publications. As Gaza Writes Back demonstrates, they are also increasingly writing fiction. In his introduction to the book, Refaat writes that almost half the stories began as class assignments in his Creative Writing or Fiction classes. “Many of the writers started as bloggers, and many had never written fiction before. Working closely with many young talents in Gaza has proven to me that all they need is proper encouragement, practical training, and close attention in order to blossom”. Five contributors to Gaza Writes Back, including Refaat, took part in the London launch. Two of the writers –Rawan Yaghi and Jehan Alfarra–are studying in Oxford and they were able to attend in person to read from their stories and take part in a lively discussion with Victoria Britain and the audience. Rawan is in her first year at Jesus College, Oxford University, studying Italian and linguistics. Jehan is doing an MSc in Computing at Oxford Brookes University. As Refaat notes in his introduction, the 23 stories are diverse in theme, setting, form, type, and experimentation. Although the focus of the book is the reaction of young writers in Gaza to Operation Cast Lead, the stories “include Palestine as a whole as an attempt to refuse any kind of division. The stories were all written in English except for the two by Nour al-Sousi which are translated from Arabic. Asked at the London launch why more stories had not been translated from Arabic, Refaat emphasized the importance of reaching the English-reading audience beyond Gaza. He was however confident that Gaza Writes Back will be translated into Arabic. He added: “We have been approached by people from as far as Japan, Turkey, Malaysia, to translate the book into their languages.” In addition people from South Africa, Canada, New Zealand and Australia are proposing a book tour. Refaat and his colleagues are planning other books, “to include more talents, more writers, from Gaza, in poetry, in children’s stories – again mainly written in English. Maybe we are going to go for non-fiction in the future, and for longer stories – maybe a novella or a novel.” He hopes that some of the stories in Gaza Writes Back will be turned into movies or documentaries. – Susannah Tarbush is a London-based freelance journalist and blogger specializing in Middle Eastern culture and politics. She contributed this article to PalestineChronicle.com.